This document describes the steps to test your skill during development. Use the utterance profiler to test your custom interaction model. You can enter utterances and see how they resolve to the intents and slots before you write the code for your service. Use the simulator provided on the Test page in the developer console. This gives you access to most Alexa Skills Kit features without a device. You can interact with Alexa using either voice or text. Test by voice using an Alexa-enabled device. Use ASK CLI to test the skill from the command line. You can test your skill using ASK CLI commands such as invoke-skill and simulate-skill. See ASK CLI Quick Start for more information about managing skills from the command line. Use the skill testing features of the Skill Management API. Regardless of how you test, you need to provide the minimum configuration data and deploy your skill service. To enable your skill for testing, you need to complete the minimum required configuration for the interaction model included in your skill. All of these settings are available on the Build page. You can test your custom interaction model with the utterance profiler after you successfully save and build your model. You do not need to configure an endpoint for this testing. For full end-to-end testing, complete the configuration described below. Tip: For full testing, use the Skill builder checklist on the Build page as a guide to the minimum steps you need to complete before you test your skill. When the checklist shows that all items are complete, your skill is ready to test. The model must build without errors. A valid AWS Lambda ARN or HTTPS endpoint. At a minimum, fill in the Default Region field. For HTTPS, be sure to indicate the SSL certificate type. For testing purposes, you can use a self-signed certificate, although you cannot use this configuration when you publish the skill to users. Custom > Interfaces: If your skill uses any of the device interfaces, enable them on this page. Account Linking: If your skill uses account linking, configure it here. Note that the full account linking configuration is not required to test intents that do not require authentication. However, it is required to test any intent that returns a LinkAccountCard or that requires authentication. Permissions: If your skill uses any permissions (such as for the Device Address API), enable them here. Smart Home > Smart Home Service Endpoint: A valid AWS Lambda ARN endpoint must be provided. At a minimum, fill in the Default Region field. Account Linking: All required fields on this page must be complete. Permissions: If your skill uses Send Alexa Events permission, it must be enabled on the Permissions page. You also need an account configured for your device cloud and discoverable devices for that account. Video > Video Skill Service Endpoint: A valid AWS Lambda ARN endpoint must be provided. At a minimum, fill in the Default Region field. N/A: In this case, your service is an RSS or JSON feed. 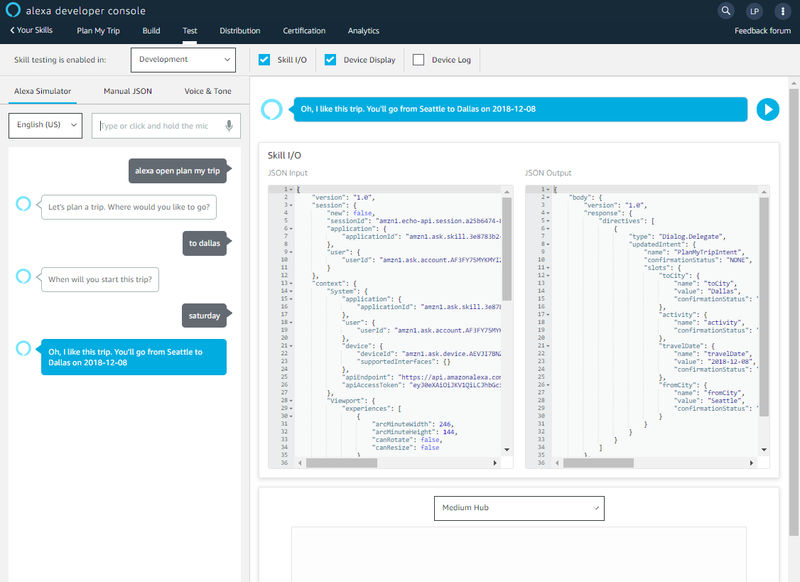 See Flash Briefing Skill API Feed Reference. You must use an AWS Lambda function. See the Add a Lambda Function section in Steps to Build a Smart Home Skill. You must use an AWS Lambda function. See the Add a Lambda Function section in Steps to Create a Video Skill. The Test page includes a simulator that lets you test your skill without a device. When you are ready to test the skill, navigate to the Test page. If testing has not been enabled for this skill, then you will see Test is disabled for this skill., with the drop-down selection set to Off. From the drop-down list, select the desired skill testing stage, which will be either Development or Live. If testing has been enabled already, then from the Skill testing is enabled in: list, select the desired skill testing stage, which will be either Development or Live, or select Off to disable testing. A skill can only be in one stage at any time. For example, if you enable your skill for testing in the Live stage, your development skill will be disabled for testing, and your live skill will continue to be available in the developer console, SMAPI, ASK CLI and your devices that are signed in to your developer account. As part of this enablement in the developer console, the page will be redirected to the live stage URL and all session and context information will be reset. If you have any information you want to preserve, save it before proceeding. This activity will also generate a new User ID and can be used to simulate a first-time user experience. If your live skill is configured with a live lambda version, that live version will be used as part of this stage enablement. You can use the Test page to test most functionality in a skill, including dialogs, progressive responses (with limitations), and entity resolution. The page provides three tabs on the left for different types of testing. Use this to interact with a custom or smart home skill with either text or your voice. The simulator maintains the skill session with your skill just as a device would, so you can test the dialog flow. The simulator also sends any cards that your skill returns to the Alexa app the same way a device would. If your skill supports multiple languages, select the language you want to test from the drop-down list. Enable Skill I/O to see the JSON sent to your skill and the JSON returned to Alexa for each turn of the conversation. Note that the JSON is only available for custom skills. Click on a speech bubble to see the JSON related to that turn. Enable Echo Show Display to see an approximation of how the skill displays on the Echo Show. Enable Echo Spot to see an approximation of how the skill displays on the Echo Spot. Enable Device Log to see the events sent to Alexa and the directives sent to the device during the skill interactions. See Intent Debugging. Enable Echo Buttons to display and interact with simulated Echo Buttons. This option is only available to skills that support the GameEngine interface, the GadgetController interface, or both. For more information, see How to Test an Echo Button Skill. Enable Alexa Smart Home (Beta) to see the ChangeReport events that the skill sends to the Alexa event gateway. This option is only available to smart home skills. For more information, see Debug Your Smart Home Skill. Note that a skill session within the Alexa Simulator tab does not time out the way a device would, to give you more time to enter your responses while testing. If your skill keeps the session open, you can close it with "Alexa, stop." Use this to enter a JSON request directly and see the JSON response your skill returns. This option does not maintain the skill session. This is very similar to testing a JSON request in the Lambda console. Note that the Echo Show Display, Echo Spot, and Device Log options are not supported for Manual JSON. If your skill supports multiple region-specific endpoints, you can select the endpoint to test from the list near the bottom of the page. Use this to enter plain text or SSML and hear how Alexa speaks the text. Select the language you want to hear from the list at the bottom. All supported languages are available in this list, even if your skill does not support them. Note: The Alexa Simulator behaves like a device with a screen, such as the Echo Show or Echo Spot. This means that the context.System.device.supportedInterfaces property in the request sent to your skill always contains the Display interface. In addition, the simulator is not supported for use in multiple browser tabs at the same time. The following limitations apply to voice and text testing on the Alexa Simulator tab. The Alexa Simulator does not render the audio playback, but the Skill I/O section shows the AudioPlayer directives sent from your skill. Since the playback does not occur, you cannot test AudioPlayer requests that are triggered by events in the playback, such as PlaybackNearlyFinished. The Device Address API lets you request address information associated with the user's device. When testing with the Alexa Simulator, your skill can call the Device Address API and get back a non-error response. You can also test the flow when the user has not provided the device address permission. However, note that the address fields in the response are set to null and the postal code field is set to a default US postal code. The Test page cannot be configured as a full device in the Alexa app. You can test skills that use the Display interface, and you can enable the Echo Show Display and Echo Spot options to see an approximation of how your responses will look on the Echo Show and Echo Spot. However, this does not show how your responses would display on any other devices, such as Fire TV. The Alexa Simulator does not support testing flash briefing skills. Skill I/O is available for simulated voice requests and launch requests only. Echo Button colors in the Alexa Simulator might not match the colors rendered on physical Echo Buttons. We recommend that you test colors on physical Echo Buttons before publishing your skill. With Location Services, your skill can request dynamic location information associated with the user's device. When testing with the Alexa Simulator, your skill can test the flow when the user has not provided location services permission. However, the simulator cannot test the case where the customer has granted permission. These requests are sent to a skill when a user interacts with controls such as a remote control. These requests cannot be tested with the Alexa Simulator. The progressive response and the full response are played in the simulator in the same audio stream once the full response is ready. This means you will hear the progressive response immediately followed by the full response. The simulator will not provide the reminders expected from the skill. In general, Alexa Settings API allows you to retrieve the time zone, distance measurement unit, and temperature measurement unit from the customer's Alexa settings. However, if you attempt to query the Alexa Settings API using the deviceId and apiAccessToken values generated by the Alexa simulator, you will only be able to retrieve the time zone value. If you attempt to retrieve the distance measurement unit or the temperature measurement unit, you will get an "Error 204 No Content" error message. The smart home live debugger is in beta and is subject to change at any time without notice. For more information, see Debug Your Smart Home Skill. The Alexa Simulator does not render the video playback, but the Skill I/O section shows the VideoApp directives sent from your skill. In the Alexa Simulator, the Device Log shows the consideredIntents returned in the JSON response, so you can see the intents that were considered and discarded. You can use this information to perform intent debugging and determine how to use additional samples to train your model to resolve utterances to their intended intents and slots. Visit the web version of the Amazon Alexa app (alexa.amazon.com) and sign-in with your Amazon developer account. Follow the on-screen instructions to re-register your device with your developer account. Note that this will unregister the existing e-mail address. If you want to add back a non-developer account as a user of the device, you can do so by using the Household feature.